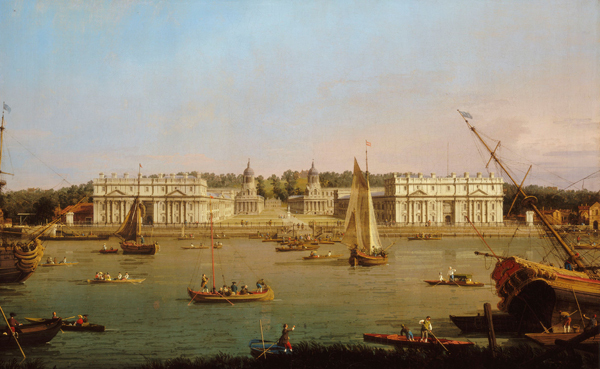 Canaletto’s image of Greenwich Hospital from the north bank of the Thames (1750-52) is among almost 400 paintings, manuscripts and objects selected to be part of the National Maritime Museum’s new exhibition, Royal River: Power, Pageantry & The Thames. Curated by historian David Starkey, the exhibition, part of the Diamond Jubilee celebrations, focuses on the use of the river across five centuries covering events including Anne Boleyn’s coronation procession and Admiral Lord Nelson’s stately funeral through to the evolving Lord Mayor’s pageant and the ‘Great Stink’ of the mid-1800s. Highlights include the oldest known copy of Handel’s Water Music, the sixteenth century Pearl Sword (which the monarch must touch on entering the City of London), a stuffed swan, treasures from the City’s livery companies, and another Canaletto work – this time his famous view of the river filled with boats getting ready for the Lord Mayor’s Day, seen as an inspiration for this year’s Diamond Jubilee Pageant and on show in the UK for the first time since its completion. As well as celebrating the Diamond Jubilee, the exhibition also marks the 75th anniversary of the opening of the National Maritime Museum by King George VI on 27th April, 1937. The king’s speech from that day and his Admiral of the Fleet uniform also feature in the exhibition. WHERE: National Maritime Museum Greenwich (nearest DLR station is Cutty Sark); WHEN: Daily 10am to 5pm (opening times may vary during the Paralympic and Olympic Games) until 9th September; COST: £11 adult/£9 concession/family ticket £24.50; WEBSITE: www.rmg.co.uk.